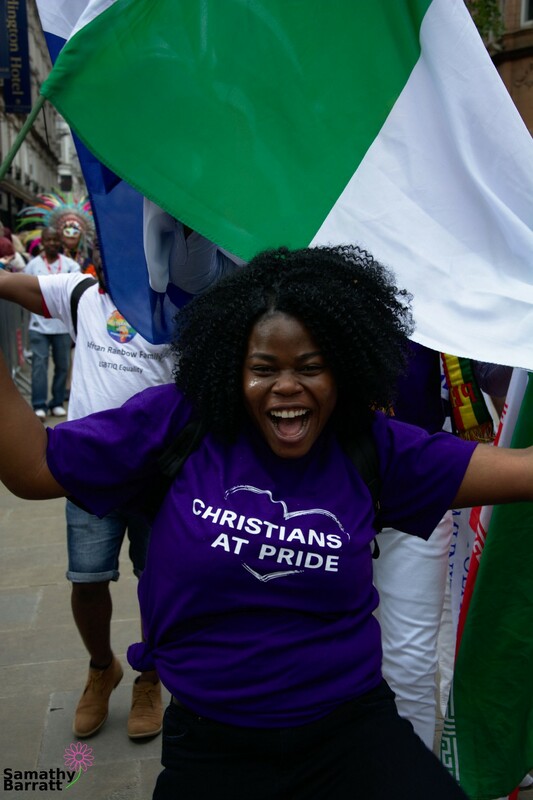 Pride Vibes: As a photographer for Gay Pride Pics, I attend lots of Prides across the UK every year. Each Pride has a different feel. This series will describe what each Pride was like and what the vibe of the pride was like. The entire series is my opinion and mine only. Take it as you will. Note that this opinion comes from a 20 something extroverted transwoman who is herself a pride organiser. I’m still working out what this series is going to be like. Bear with me. 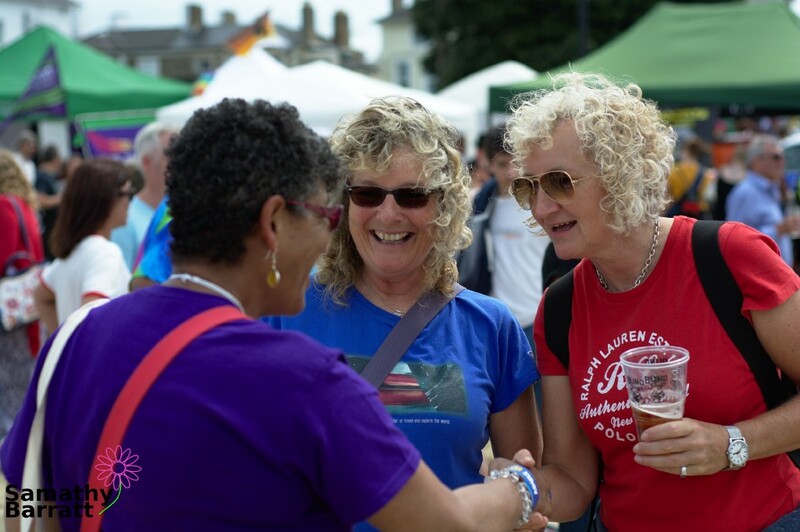 We were delighted to share Isle of Wight’s first ever Pride festival with the Isle’s inhabitants and visitors from the mainland. The Isle of Wight Pride had already seen quite a lot of press coverage, such as the article from Isle of Wight County Press and the Isle of Wight’s former MP making homophobic statements and so attracted not only a lot of islanders, but also people turning up to support a Pride that proved much more controversial than expected. TL;DR The event was absolutely incredible. It was the best Pride this season with by far the best vibes going. Inclusive, welcoming, and excited. It felt like the whole island turned out for the parade. 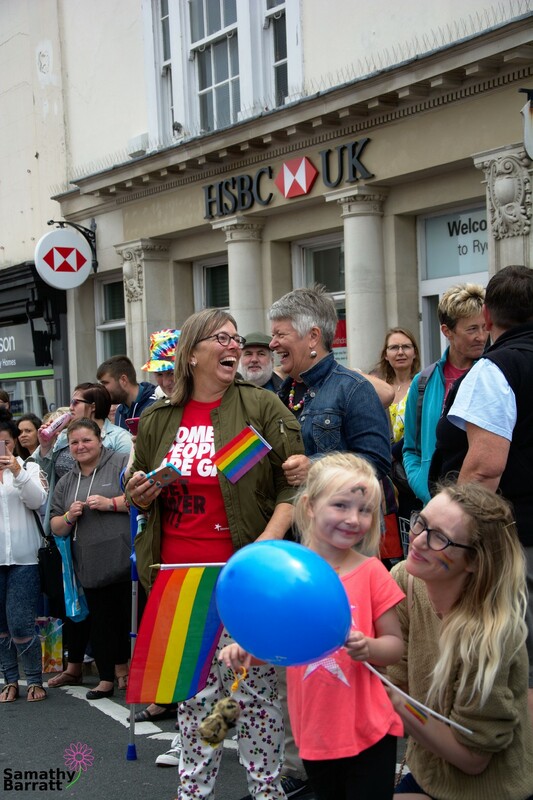 The Isle of Wight Pride started with a parade through the town of Ryde. I was astounded to see what seemed like the entire town, maybe the whole island’s population on the streets for the parade. There was a diverse group of people watching the parade, we saw the old, young and everyone in between. The buzz from the parade was huge, everyone was so excited to see a Pride parade in their small town. The buzz from the parade was huge. Everyone was so excited to see a Pride parade in their small town. Everyone was showing their support for each other, and the marchers. 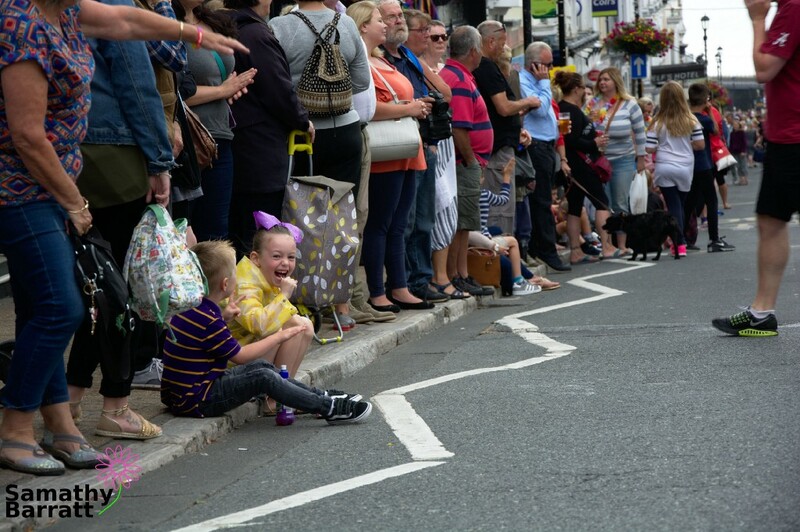 The parade featured mostly charities, with a few local branches of businesses present, and some larger ,more well known organisations like Outdoor Men and a surprisingly large contingent from the Scouts. 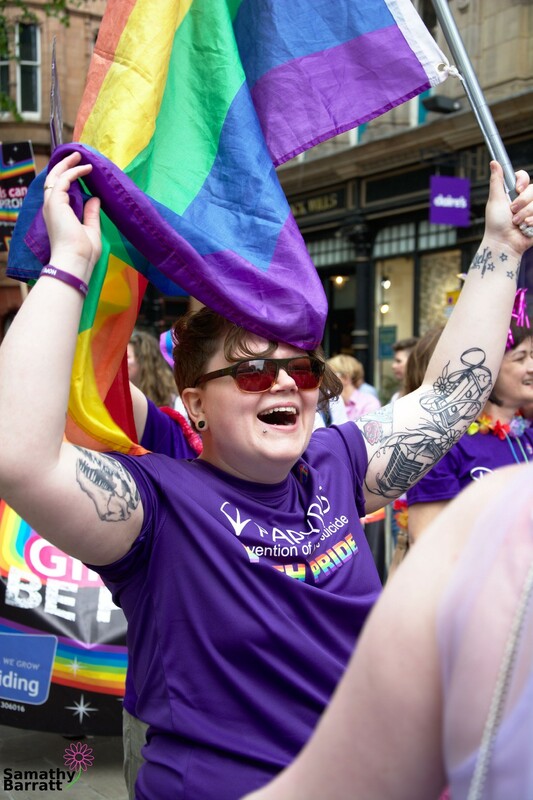 While nowhere near as long as larger, more established Pride parades like Birmingham or Exeter, the Isle of Wight parade was extremely long considering its their first one. The parade finished at the Pavilion down by the beach with people tailing the end of the parade off the streets towards the entrance to the main event. Unfortunately, the main event was ticketed, but free. This is because of an old law preventing the Isle of Wight from holding an event with more than 5000 people attending. 5000 people is totally more than enough for a first Pride, but I certainly think that if it wasn't for this law, there would have been many more people there. The main event, as mentioned, was held partly on the beach and partly on the beach front. Isle of Wight Pride featured a reasonable set of stalls, mostly commercial, on their grassy section. I felt that the large amounts of commercial stalls appeared like they were profiteering from the ‘pink pound’ as a lot of these stalls were not really specifically LGBT+ related. There were a few LGBT+ charities in attendance. I most noted the presence of Mermaids and was amazed to see them on the island. Maybe it felt like there were a lot of commercial stalls because there really were not many stalls in total at all. All stall holders were incredibly friendly and I enjoyed feeling very comfortable talking to them. The feeling around the stalls was very relaxed and calm. They seemed to be seeing loads of custom and the two stages on the grassy area always had an audience sitting quietly and enjoying the shows being put on there. People in the stalls area seemed just happy to be there and comfortable being who they are. The main stage was on the beach section, which was a totally different experience from any other Pride I’ve been to. The beach was quiet at first before people really started arriving. The beach stage did feature quite a lot of drag acts, 5 in total I think, but counteracted the large drag presence with powerful political statements and spoken word from several people including Peter Tatchall and Hannah Phillips. The main stage also featured plenty of musical performances across the day. I was really happy to see Isle of Wight Pride welcome political statements on their stage. It really helped make me feel like the event is keen to maintain itself as a political pride which is well aware of its roots and all the work that still needs to be done by the Pride movement. 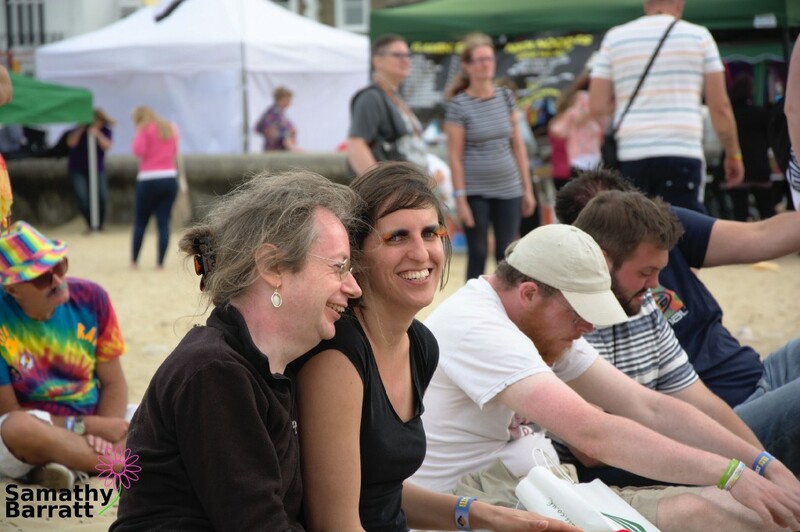 It should be noted that although the stage was on a sandy beach, IoW Pride put down plastic boards over some of the beach to allow wheeled personal transport like buggies and wheelchairs access to the main stage area, a great touch. 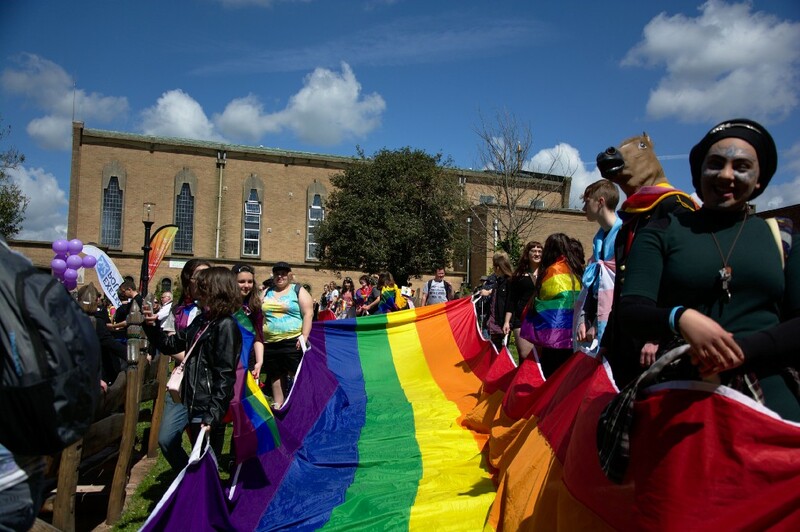 Unlike many Prides it was not overwhelmingly attended by students and young people, but saw a wide ranging attendance base from young people, young couples, young families alongside older people, and established families. 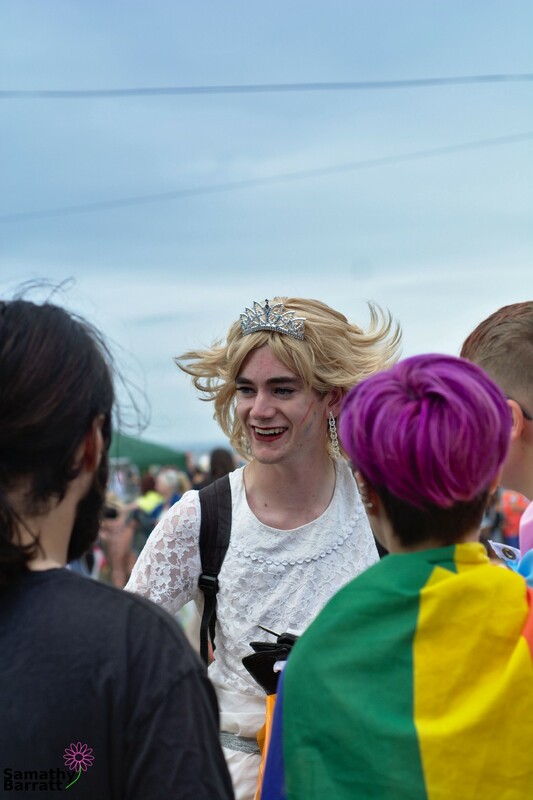 Most Prides do see people from all age groups, but it was extremely striking at IoW to see people from every walk of life. This diversity really enhanced the vibes of the event. It was such a happy event, but certainly not an alcohol-fueled party like so many other Prides can be. I never felt uncomfortable with the level of drinking as I have been previously. 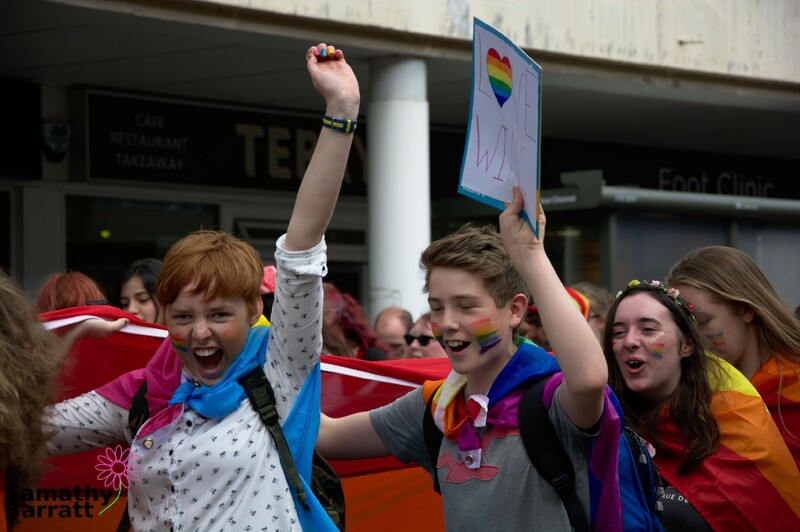 It seemed like everyone there was there to show their support for the Isle of Wight’s LGBT+ population, and that the Isle of Wight had Pride in their LGBT+ culture. Despite the lower population of younger people, I really felt included in the event and all the people I spoke to were also loving it. It should be noted, however, that it seemed like most attendees were white British people. Not surprising considering the pride was on a small island, but I’m fairly sure I could have counted the amount of people of colour on two hands. 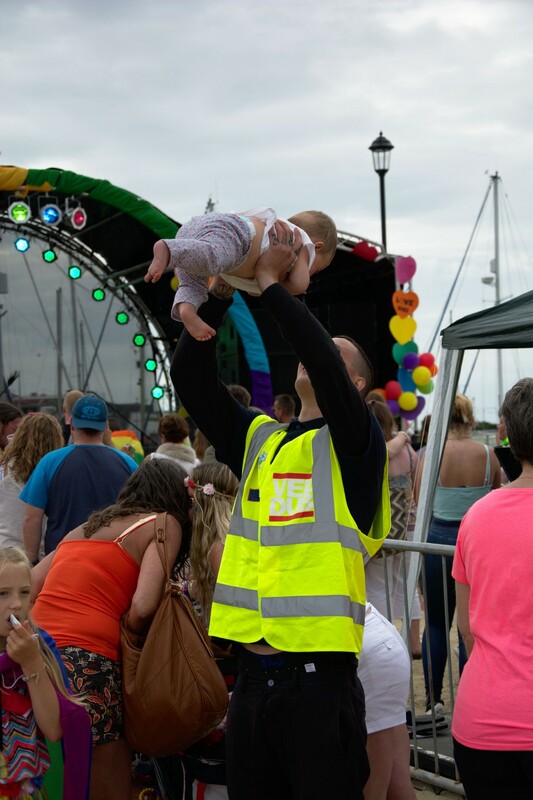 For me, Isle of Wight Pride truly felt like people were proud to be there showing their colours. Generally, the event was absolutely astounding. I was amazed to see such a wonderful, diverse turnout from the island. 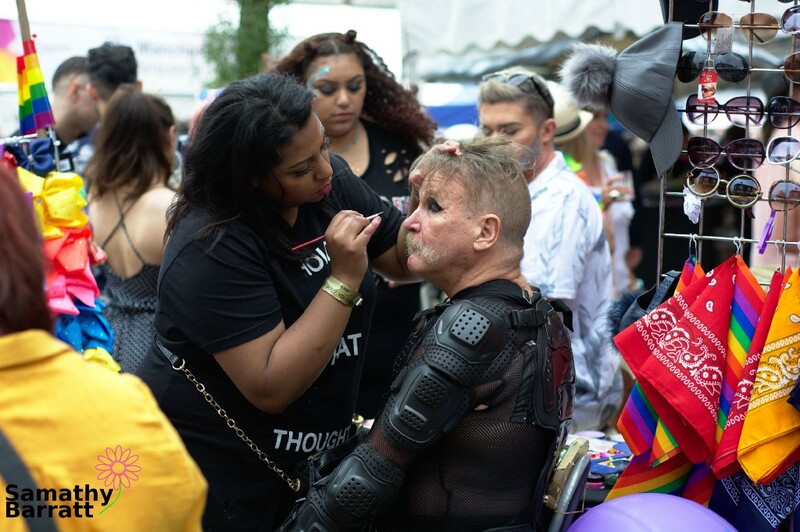 The event had an excited vibe with people showing so much support for the LGBT+ community. Best Pride of the season so far. Best of luck to the Isle of Wight Pride organisers and thank you for welcoming us to such a wonderful event. May your future events continue to have the same vibes as this one. Pride Vibes: As a photographer for Gay Pride Pics, I see lots of Prides across the UK every year. Each Pride has a different feel. This series will describe what each Pride was like and what the vibe of the pride was like. 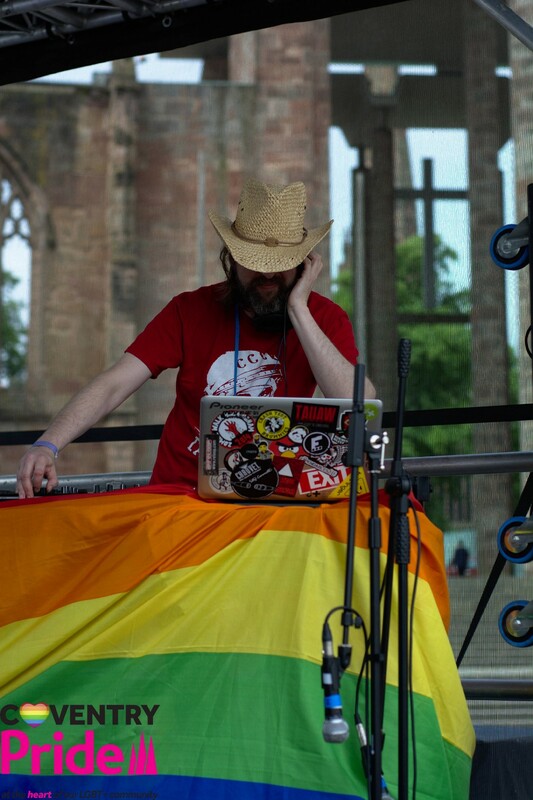 Full Disclosure: I am a trustee and organiser of Coventry Pride. I work specifically on Press and Publicity. This post will be more biased than normal. Coventry Pride is in its 3rd year. It’s a smallish pride with a big personality. It brands itself as a ‘Community Pride’ and makes a huge effort to welcome all members of the extended LGBTQIA+ community. 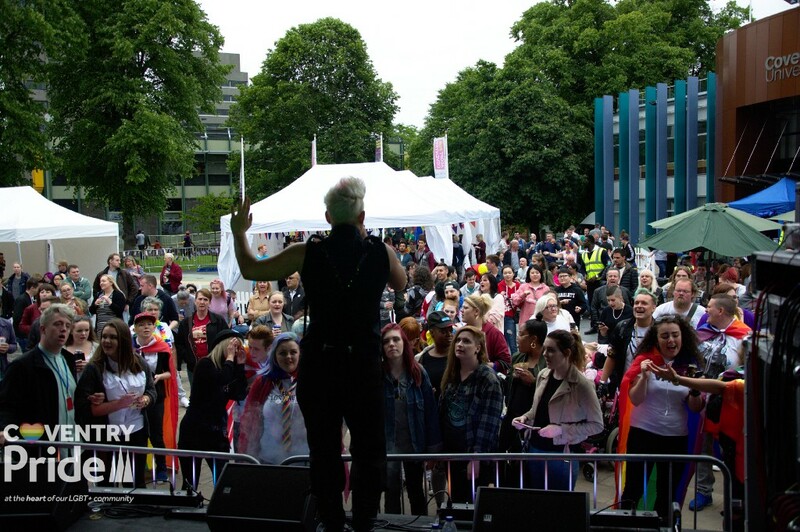 Coventry is a completely free pride welcoming attendees in to a new venue in the centre of the city, University Square. The venue is much larger than the previous at FarGo Village allowing for massive expansion this year. Situated right outside the iconic dual Cathedrals the new venue proved much better than last year. It’s a much bigger space and the event felt very open and a lot less crowded than last year’s pride. Although, it certainly didn't feel packed, it certainly felt buzzing with happy energy. The main stage was fairly large and could be seen and heard throughout most of the main square area. Most of the acts proved to be a great success with the audience. Most of them were musical acts with a smattering of comedy, with the drag acts largely kept to the cabaret stage which is inside Square One, the Coventry University Student’s Union bar and club. The main square area also featured a bar, which, despite its central location did not result in large amounts of drunk people making me feel uncomfortable. In fact, I don’t think I saw anyone I would be able to describe as anything other than sober. Which, for me is a good thing. 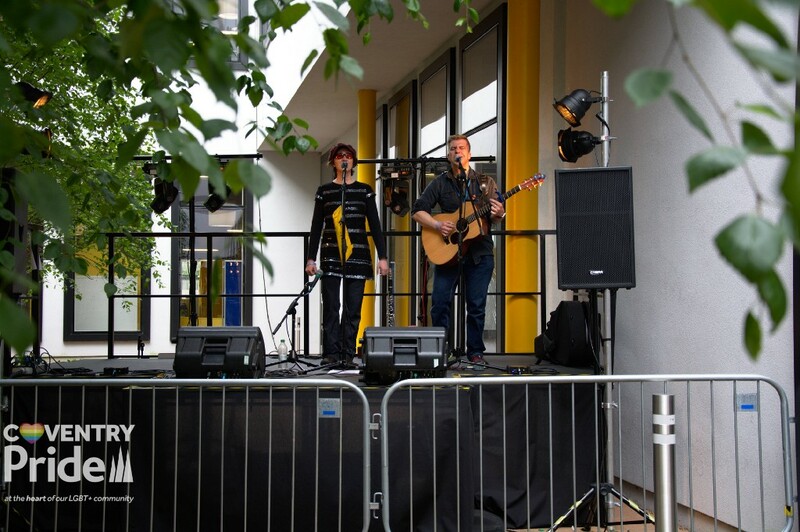 The supporting stages in Square One featured smaller musical acts and community comedy performances. Welcomed there were a host of great acoustic musical performances, drag and both small-time and big-time comedy. The supporting stages welcomed smaller, intimate performances. The diversity of the event was wonderful. 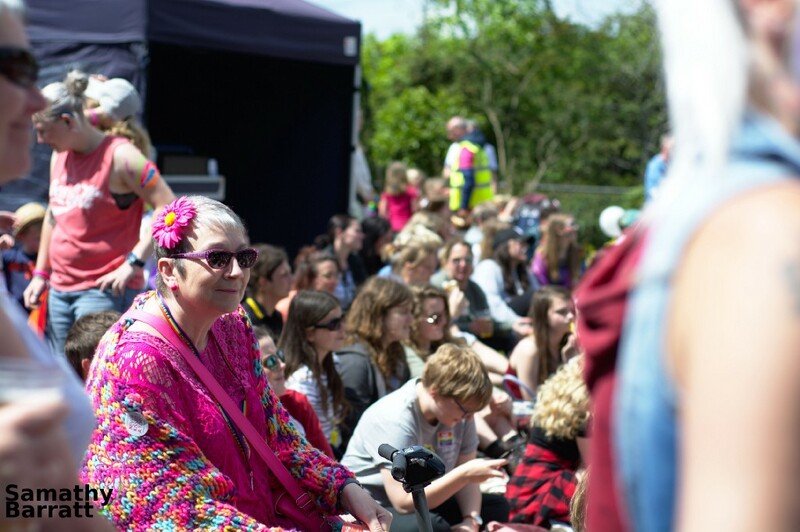 Being a free event, Coventry Pride is lucky to be able to be open to people of all ages and orientations. There were lots of families and younger people attending, which was fantastic to see and really helps with the open and welcoming feel of the event. We saw young and old people attending and having fun. Most importantly we saw people from so many identities! At least, as far as I could tell from the flags people were wearing. This really helped me and a lot of my friends feel included in the event. The presence of such a diverse set of people really supported the comfortable feeling of a space where one could be themselves without worry. As well as the outside main area, we also had an inside arrangement of community stalls. The community stalls were a huge part of the event. The stalls were as diverse as the attending crowd. 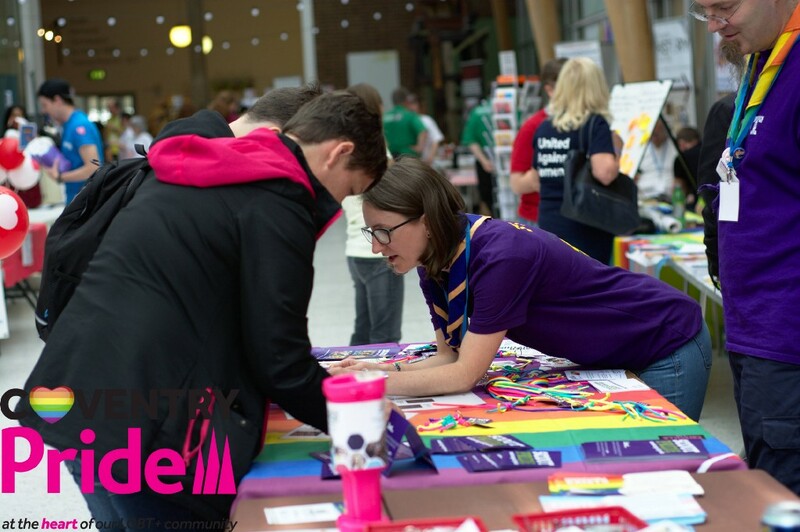 We had everything from stalls selling art, offering counselling services, information about scouting, LGBT+ identities and so much more. 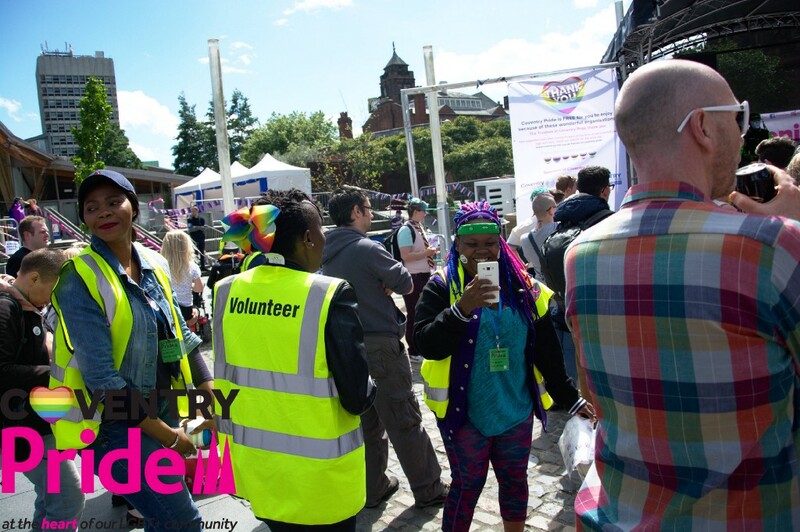 We’re really pleased with the amount of community stalls we had and they really helped to maintain the vibe that Coventry Pride aims for. People supporting other people. The stalls were located inside The Herbert Art Gallery and Museum which proved to be a near perfect venue. 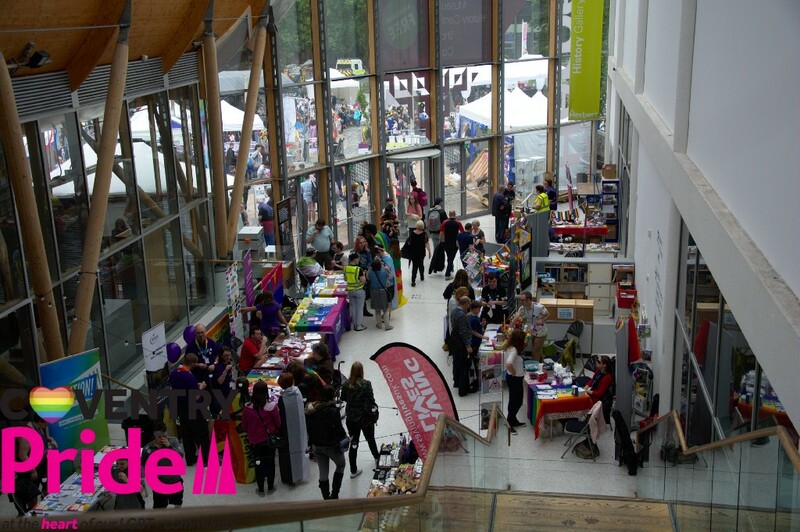 The Herbert provided their huge atrium space for the community stalls which offered a lot of space for attendees to peruse the stalls at their leisure. The Herbert also offered their gender neutral toilets for Coventry Pride attendees, which was a great bonus to go along with the portaloos and toilets in the University SU. One thing I noticed at the event was the policing, or lack of. There were officers at the event and around the surrounding area, but they felt much more like participants in the event rather than bystanders. We saw officers taking photos, talking to stall holders and seemingly having a great time, just like everyone else. The police were as much participants as everyone else. The Sargent on duty on Saturday was a great guy who was super interested in learning as much about the LGBT+ community as he could, asking polite questions when appropriate. He even requested to be posted at Coventry Pride on the Sunday too because he enjoyed the event so much. 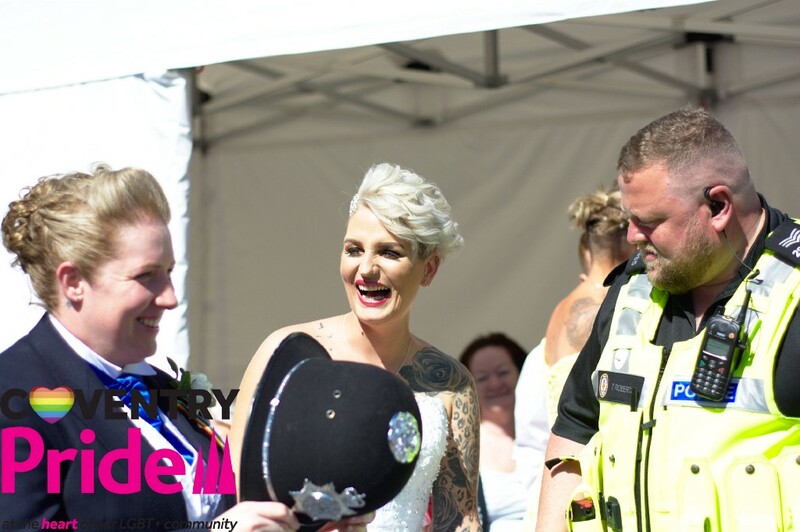 A huge event at Coventry Pride 2017 was The Blessing of Haley Bridge and Claire Haines. Haley and Claire were married earlier on the Sunday at the Guild Hall just up the road from University Square. 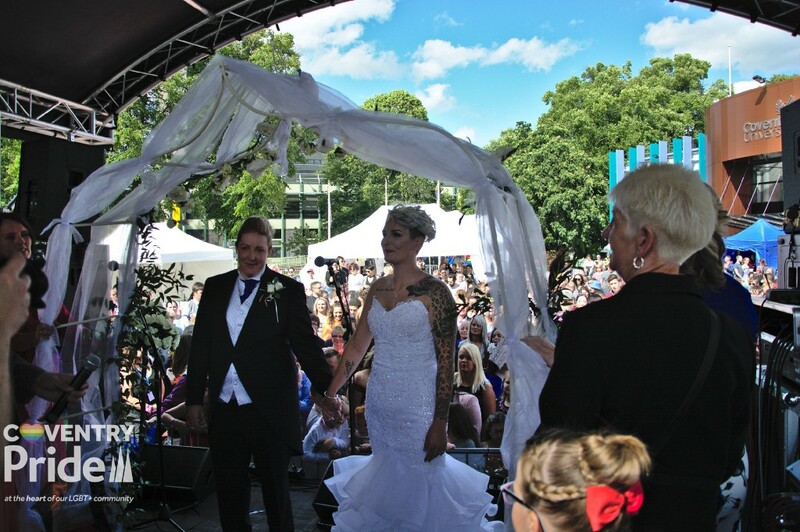 Following their wedding, we welcomed the beautiful brides to Coventry Pride and the Chair of Coventry Pride, Paul Desson-Baxter, blessed the wedding in front of 100s of people. The blessing was a beautiful event. It truly was wonderful to see two women married and celebrate their marriage at a Pride event. All in all, Coventry Pride was a fantastic event. We’re super happy to have been able to offer an event welcoming such a diverse selection of people from our community. 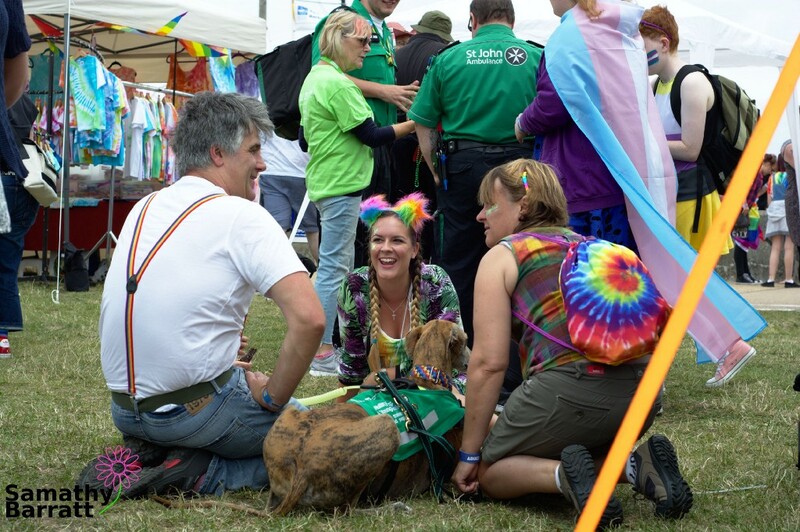 We’re glad that we’re able to offer the event for free to everyone who wants to come, giving access to all those who need a Pride in their local area. As always, the volunteers and organisers of Coventry Pride did an amazing job and put in an awful lot of effort to make it happen. Birmingham Pride is the biggest Pride in West Midlands. Its one of the biggest in the UK too, competing directly with the likes of Manchester, London and Brighton. It draws a totally different crowd to that of smaller, community Prides like Exeter, Coventry and Harrogate, for example. Birmingham Pride is a very extravagant Pride, with costs in the range of several £100,000's. Birmingham’s parade featured big companies. Birmingham’s Parade is a huge affair. 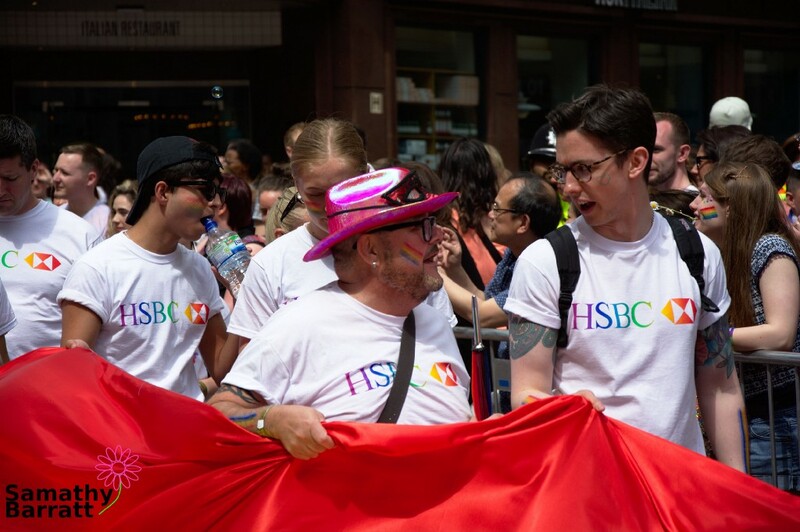 It features 10s of organisations from big corporate companies like Asda and Virgin to charities like Birmingham LGBT and Stonewall. Birmingham’s parade also features a lot of Students, given that each one of its Universities were represented there. Christians and other religious organisations were represented. Despite the size of the parade through Birmingham, everyone who walked in it was with some kind of organisation. Everyone was there to represent someone. Like most bigger pride parades, with Birmingham you’re required to register your marching group and identify roughly how many people are walking with you. Such a practice prevents the more organic ‘marching for pride’ that you get with smaller Parades. The result is a parade that features a lot more older people associated with their companies and organisations. Which is great for seeing just how many companies support the Pride movement, but not great if you simply want to join in the march and stand up for what you believe in. Birmingham Pride does however, feature protesting groups. There were several groups chanting in protest of current issues. Stand out groups included a several religious groups, Out in the UK (LGBT+ Asylum seekers), and of course Black Lives Matter. 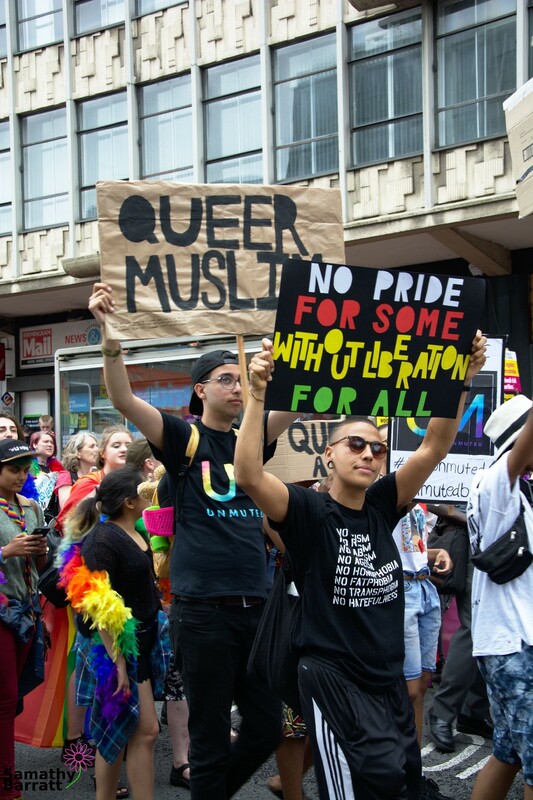 It was great that Birmingham’s pride march supports protesting groups and is clearly in favour of providing the platform for Pride as A Protest. It really felt like Birmingham Pride’s parade is a good balance of Pride as a celebration and show of big society support and Pride as a Protest march aimng to raise awareness of issues we still face. People used Birmingham Pride’s parade as a protest platform. Birmingham’s large Pride parade draws people out onto the streets. The whole parade route is lined with people who, despite not being in the parade itself, are just as involved. The people of Birmingham and the West Midlands seem to make a decisive effort to come out and see and support the Pride Parade. It creates a busy atmosphere, but in my opinion its not necessarily one of support for the causes. I felt like a lot of people watching were watching simply for the spectacle of seeing a Pride, rather than because they whole heartily support the Pride movement. Not that there were not lots of people who clearly supported the movement too, mind. The Gay Village at Birmingham Pride is a rather different experience to the free Prides in the UK. At £22 for a standard entry ticket, lots of people are deterred from entering the branded ‘Gay Village’. A naming I Strongly disagree with. I noted, that as soon as the parade broke away and the village opened, the type of people around suddenly changed and the vibe pivoted to something completely different. Instead of feeling like I was on a semi-protest march for LGBT+ rights, I was now in some alcohol and nicotine fueled festival that seemed to have absolutely no purpose except to provide a reasonably cheap way of seeing lots of musical artists in one place. For me, as soon as we went into the village area the Pride lost all sense of, well, Pride. The people there completely changed, there were practically no young people at all around. Suddenly a huge amount of straight people arrived, and I noticed a sharp decline in the amount of people of colour. I even spotted a couple of hen parties (not that hen parties are bad, but it felt exploitative of the Pride movement). Thats not to say ALL people from the parade left. This photo of a fetish (?) man getting his face painted highly amuses me. There were clearly people having fun, and at the start, Idid enjoy seeing so many people meeting their friends and having a jolly gay time. But as the day drew on, the haze of cigarette smoke increased over the absolutely packed venue area. I was struggling to move around, I struggled to breath properly and I started to feel very uncomfortable presenting as myself. Entirely not what I expected from an event branding itself as a Pride. 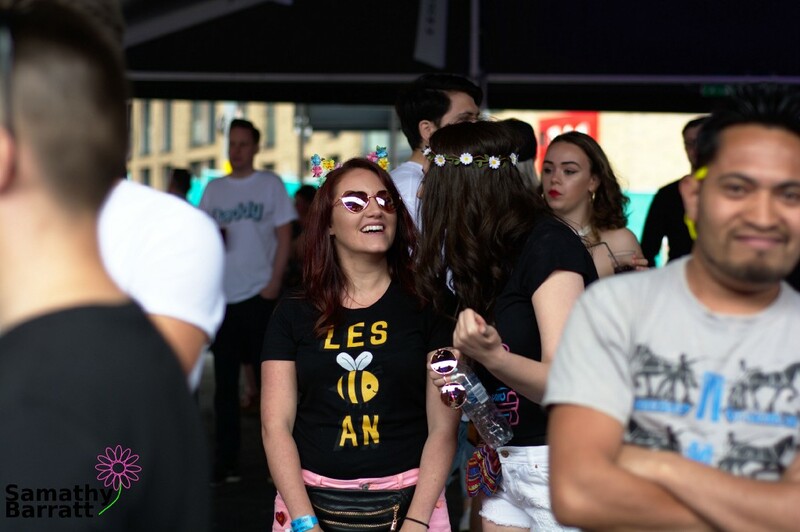 In general, for me, the vibe went from feeling like a reasonably inclusive Pride to feeling like a hell hole of drunk people whome I was not safe around. Your mileage may vary on this! Its totally possible that I felt uncomfortable because I was not with friends, I was not drinking and I was not particularly enthused by any of the acts on. Clearly, there were lots of people having a great time in Birmingham Pride’s gay village, and I don’t believe that its going to be a terrible experience for everyone. 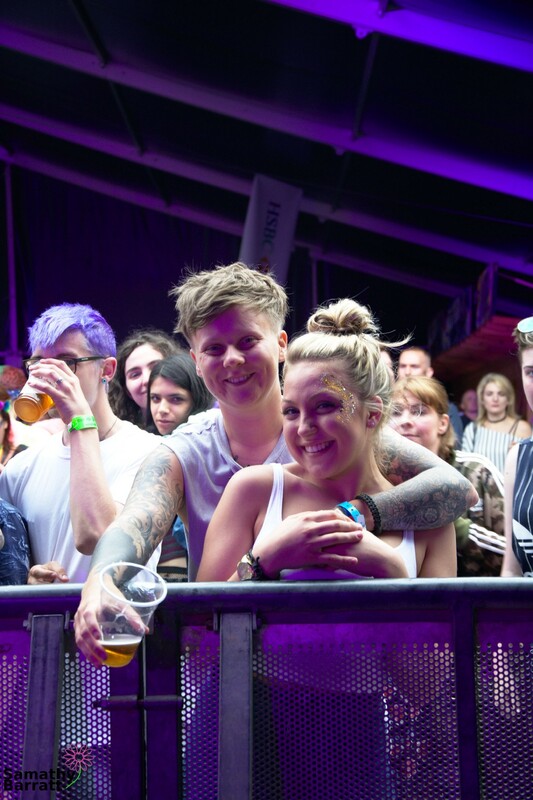 Birmingham Pride does provide a fantastic set of acts on a number of stages with some great venues in which to have a fun old time with your favourite people. They do a great job of making your £22 ticket go a long way too. Despite my compaints about the event, I’d like to congratulate the the Birmingham Pride committee and all the volunteers on pulling off its largest Pride yet! Like all Prides, its unique and special in its own way. I await seeing next years Pride. My first Pride of the 2017 season was eagerly anticipated. The weather looked promising and the prospect of attending a Pride I hadn't yet visited was exciting. 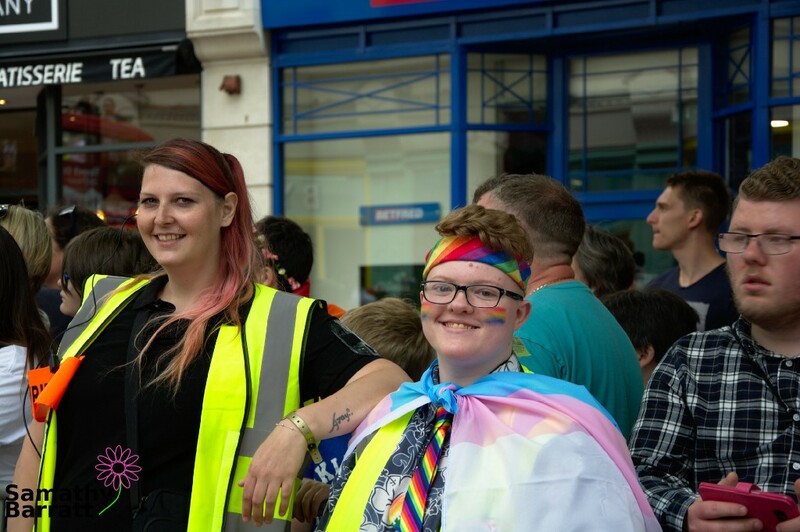 Exeter Pride 2017 is the 9th Pride in the city, run by an experienced team. Exeter’s Pride parade starts off at a Church in the centre of the city. I arrived and was greeted by a very friendly and seemingly super well organised set of volunteers and organisers. Gathering for the start of the parade took place in the grounds of the church. 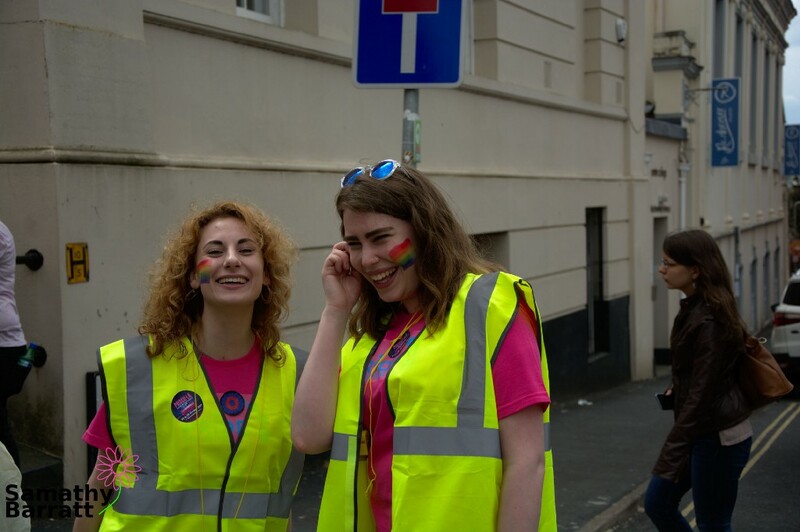 I was really happy to see tens of young people being hustled by the volunteers to carry the super long rainbow flag. It felt super welcoming to see so many people younger than myself happy to be carrying the flag through the city. I noted the lack of corporate groups in the initial parade organising. The church grounds were buzzing with excitement. As well as young people featuring in the parade there were a suitable amount of costume wearing people too. I spotted someone in a horse mask, furries, dragged up people and the parade was lead by The Centurion. 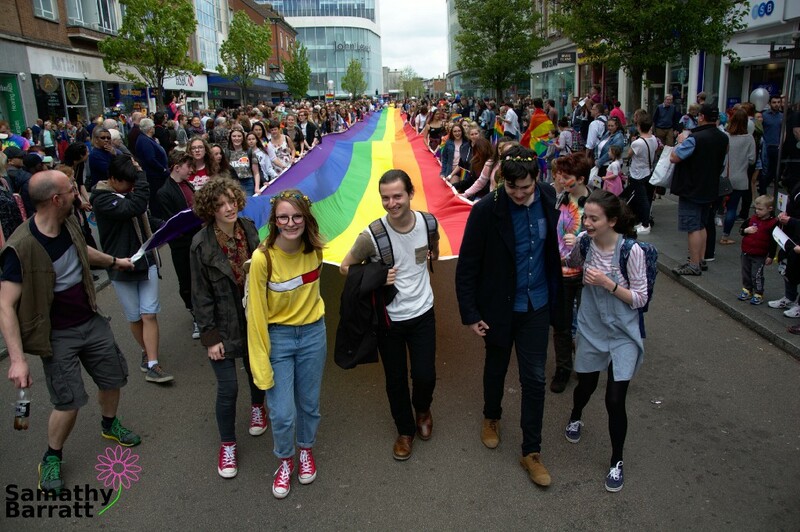 A huge rainbow flag carried by mostly young people, onlookers watch. The parade wound through the city, attracting hundreds of onlookers, most of which didn’t seem to have planned to see a parade that day. The parade was a very happy affair, everyone in it was really pleased to be there. There were no chants during the parade and very few groups taking advantage of the platform to use it for protest. I wouldn’t say it was a ‘carnival’ parade since it was mostly people walking holding onto the flag, but it certainly was not a protest march. The police marched in the parade, as did a group of Christian pastors. The parade was just about the right length and generally felt like a really nice place to be. I think this was mainly because it was almost entirely young people marching for themselves and for Pride, rather than corporations and charitable organisations. 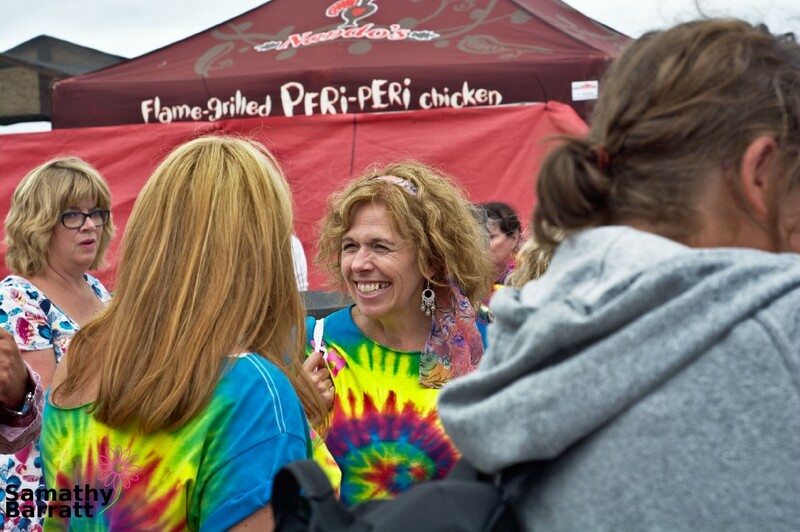 The main event was an outdoor field affair with a single stage, and a fair amount of community and commercial stalls. 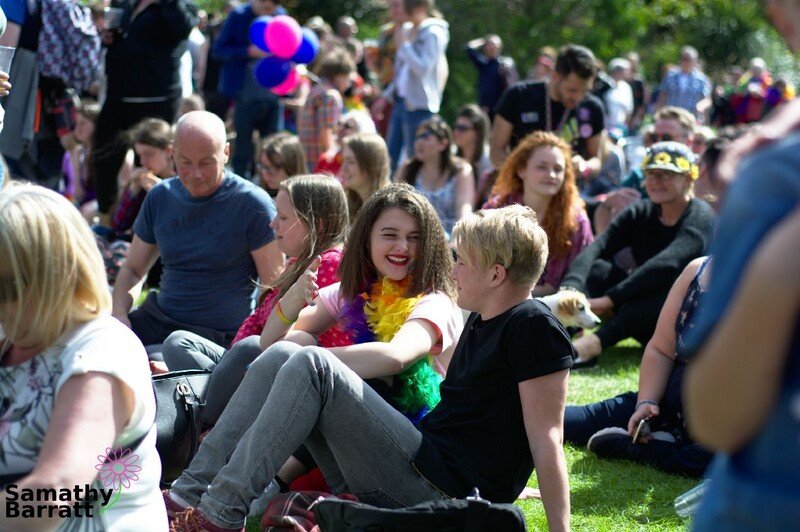 Being a completely free to attend event, Exeter Pride maintained the relaxed and welcoming feel that the parade exuded. Mostly people found their spot on the sunny grass and stayed there all day. The event felt very chill and very calm. Although there were bars were not fenced in, there was not a huge amount of uncomfortably drunk people around. People seemed to be content with eating the great food and didn't need to go wild, even into the evening. That really helped me to to feel welcome. The event was attended by lots of different people. Although it was certainly awash with white faces, we saw young people, older people and disabled people attending and having a great time. 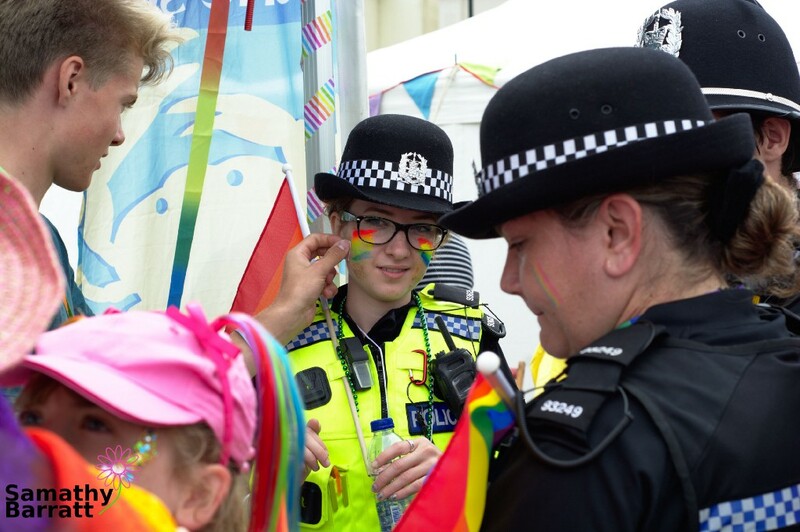 Overall, Exeter Pride managed to create a very safe feeling happy Pride with a great community feel and welcoming atmosphere.